Why Is Katie Couric Letting Floyd Mayweather Smear His Victims? Katie Couric is a serious journalist. She was the first woman to anchor a network evening news broadcast without a male co-host. She has been a frontline star for all three major television networks. Her interview with Sarah Palin in 2008 may have singlehandedly changed the course of American history. She knows what she’s doing, is my point. So how the hell do you explain this? Did I kick, stomp and beat someone? No, that didn’t happen. I look in your face and say, “No, that didn’t happen.” Did I restrain a woman that was on drugs? Yes, I did. So if they say that’s domestic violence, then, you know what? I’m guilty. I’m guilty of restraining someone. Just a quick refresher on the undisputed facts of that evening. On the night in question, Mayweather showed up at the home of Josie Harris, the mother of three of his children, at 2:30 a.m. Mayweather, who was engaged to another woman and living apart from Harris at the time, proceeded to berate her about her relationship with NBA player C.J. Watson, the existence of which Mayweather had confirmed by going through texts on Harris’s cell phone without her permission. The situation became so heated that Harris had to call the police, who escorted Mayweather from the premises. Harris then went to sleep. Mayweather returned, uninvited, at 5:00 a.m., with a member of his entourage in tow. According to both Harris and their son, Koraun, Mayweather then proceeded to viciously beat Harris. Their child tried to help his mother but Floyd’s accomplice blocked his path, forcing the 10 year old to flee the home to call the police. By the time the cops showed up, Mayweather had fled the scene with Harris’s cell phone, but a subsequent hospital examination confirmed that Harris had bruises, contusions, and a concussion from the blows that she sustained to the back of her head. Harris speculated he had targeted the back of her head to avoid leaving visible marks, an explanation that only gained credibility when Floyd later employed as a defense the claim that no photos existed of Harris’s injuries. In an exclusive interview, Josie Harris and her son recall night Mayweather attacked her. You’re supposed to know these things before you do an interview; I’m just a guy with a keyboard and even I understand that. Don’t take my word for it, though! Ask Rachel Nichols how a real journalist handles an interview with an unrepentant serial batterer like Floyd Mayweather. Ask Sarah Spain. Ask Richelle Carey. This is really important. Sal Paolantonio was (rightfully) skewered for asking Ray Rice what his wife’s words of encouragement were before his first football game after he knocked her out in an elevator. 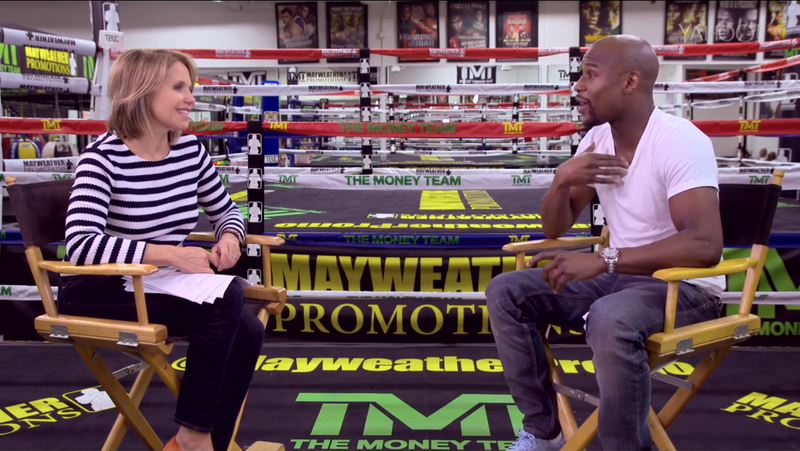 Couric’s failure to question Mayweather is worse. Mayweather’s track record of violence is both significantly longer and better documented than that of Rice, and Mayweather was allowed to smear his victim to a national audience without any cross-examination as Couric’s smiles, nods, and compliments—even a hug—tacitly communicated to a national audience that Mayweather was at worst redeemed, and quite possibly the real victim. Maybe that’s what it takes to land an interview with Mayweather these days. When Rachel Nichols pressed Mayweather on his history of domestic violence, he was so flustered that he walked out of the interview and cancelled all his remaining press appearances. No one was going to risk that happening before the Biggest Event in Boxing History™. It was inevitable that Mayweather was going to find someone to play the sympathetic ear, but it shouldn’t have been someone like Couric, a ground-breaking journalist who damn well knows better. Daniel Roberts (IronMikeGallego) is a longtime boxing fan and occasional contributor to Deadspin. He can be found on Twitter @ironmikegallego or at ironmikegallego@gmail.com.